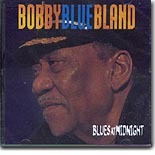 For all those doubters who thought that Bobby "Blue" Bland's best albums were behind him, let me direct you to this GREAT new release by "The Man." Without a doubt, Blues At Midnight, is his best Malaco release since 1985's Members Only. This set is a showcase for Bland's expressive and at times mournful singing. This is a collection of 11 real blues songs with not a throwaway track in the lot. With a staff of writers such as Frederick Knight, George Jackson, Mosley & Johnson, Rue Davis and three by Larry Addison, who was the writer of the previously mentioned Members Only, a classic tune that reestablished Bland's career in the mid '80s. The opening track is Knight's "Where Do I Go From Here?," a ballad that sets the tone for this outing with Bland crying over losing his woman ... a great song with great production to boot. Just listen to those great back up singers. The influence of recording back in Muscle Shoals is apparent throughout this release. The mid-paced "I Caught The Blues From Someone Else," about listening and relating to someone else's problems, is destined to be one of George Jackson's best tunes. Mosley & Johnson's "You Hit the Nail On The Head," that appeared on their excellent album back in 2000, leads us perfectly into Rue Davis' "I've Got The Blues At Midnight." this track with its great horns should become a much requested Bland classic. It ends with Bland crying out, "Willie, oh help me baby, I need you," a call from Bobby to his wife Willie Mae. Let's jump to the sixth track, the evergreen "What A Wonderful World," a song synonymous with Louis Armstrong. Although I can't imagine anyone topping Armstrong's rendition, Bland comes very close, giving us a killer version that will also be played for years to come. What a surprise! An excellent Larry Addision tune, "The Only Thing Missing Is You," leads us into the Z.Z. Hill classic "I'm A Blues Man" that opens with a great slide guitar. You know, it's the song that starts off, "I was raised up on Jimmy Reed, cornbread, collard greens and black eyed peas. I took my first bath in muddy waters....." Yeah, you know that song. Great stuff. The CD ends with another Addison track, "Ghetto Nights," a biographical song with its spoken intro and the clever use of police radios and a simulated 911 operator. What a way to close. You sit transfixed staring at your speakers, totally drained. What a fabulous experience this CD has been. Thank you, Malaco, for providing all those great veteran Muscle Shoals musicians such as Roger Hawkins, David Hood, Reggie Young, Jimmy Johnson, Larry Byrom, Clayton Ivey and Carson Whitsett, to name just a few, fantastic back up singers Jewell Bass, Val Kashimura and Freddy Young, and an audiophile recording that will enhance any sound system. And, thank you, Bobby, for giving us a recording that we will treasure forever. As with the Little Milton release of last year, Malaco seems dedicated to giving their major artists the best songs, musicians and production.